Lidija Dimkovska was born on 11 of August 1971 in Skopje, Macedonia. She is a poet, novelist, essayist, and translator. She studied Comparative Literature at the University of Skopje and took Ph.D. degree in Romanian literature at University of Bucharest, Romania. She worked as lecturer of Macedonian language and literature at the Faculty of Foreign languages and literatures, University of Bucharest, Romania. 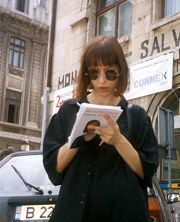 Now she lives in Ljubljana, Slovenia as a freelance writer and translator of Romanian and Slovenian literature in Macedonian. Occasionally she teaches World Literature at the Faculty of Humanistic Sciences at the University of Nova Gorica. Books of poetry: “The Offspring of the East” (1992, together with Boris Čavkoski, literary award for best debut book), “The Fire of Letters” (1994), “Bitten Nails” (1998), “Nobel vs. Nobel” (2001, available also on line, second issue 2002), “Meta-Hanging on Meta-Linden” (poetry collection translated in Romanian, Vinea, Bucharest, 2001, literary award at the international poetry festival “Poesis”, Satu Mare, Romania), “Nobel vs. Nobel” (translated in Slovenian, Aleph, Ljubljana, Slovenia, 2004), “Do Not Awaken Them with Hammers” (poetry collection translated in English, Ugly Duckling Press, New York, USA, 2006), “Ideal Weight” (selected poetry in Macedonian, 2008), “pH Neutral for Life and Death” (translated in Slovenian, Cankarjeva, Ljubljana, Slovenia, 2012), “Decent Girl”(poetry collection translated in German, Edition Korrespondenzen, Vienna, Austria, shortlisted for the German literary prize “Brucke Berlin”), and “pH Neutral History” (poetry collection translated in English, Copper Canyon Press, USA, 2012). She has edited the anthology of young Macedonian poetry “20.young.m@c.poets.00”. She published her first novel “Hidden Camera” in 2004 and for it received the award of Writers’ Union of Macedonia for the best novel of the year. It has been translated in Slovenian (Cankarjeva, Ljubljana, 2006), Slovakian (Kalligram, Bratislava, 2007), Polish (PIW, Warszawa, 2010) and Bulgarian (Balkani, Sofia, 2010). Her poems have been translated and published in more than 20 languages all around the world. She has participated at numerous international literary festivals and was a writer-in-residence in Iowa, Berlin, Graz, Krems, Vienna, Salzburg, and London. In 2009 she received the European literary prize “Hubert Burda” and in 2012 the International literary prize “Tudor Arghezi” in Romania. Her second novel “Spare Life” is forthcoming in 2012.